Applicable models:NIKON AF-P DX 18-55mm f/3.5-5.6G VR lens;Nikon D3300 D3400 camera lens. 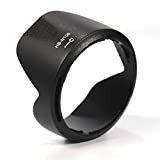 This lens hood is specifically design for Nikon only. (Not compatible with other lens model). Please Check your lens model before purchase. This entry was posted in Discount Photography and tagged 1855mm, Camera, D3300, D3400, f/3.55.6G, HBN106, Hood, lens, Nikon by Ball Photo. Bookmark the permalink.